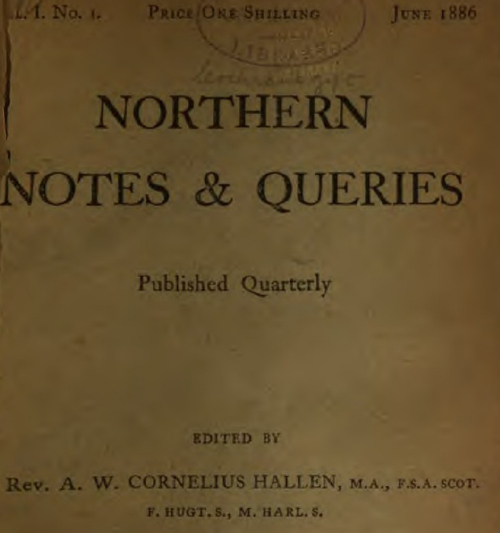 This magazine, Northern Notes and Queries, is intended for Archaeologists in Scotland and the northern counties of England. The want of suet a periodical has beep acknowledged. The English Notes and Queries long stood alone as a channel through which antiquarian information could be circulated, and answers obtained to queries, often of great interest. But now, though it still maintains its well-earned supremacy, there are in England twelve provincial periodicals of a similar character. Scotland is rich in antiquities, and possesses men second to none in zeal and capacity to utilise them as exponents of history. The English counties bordering on Scotland are also closely connected with her past life. In Scotland and the North of England there are many Societies working in a common cause, but having no common publication in which to interchange facts or theories. 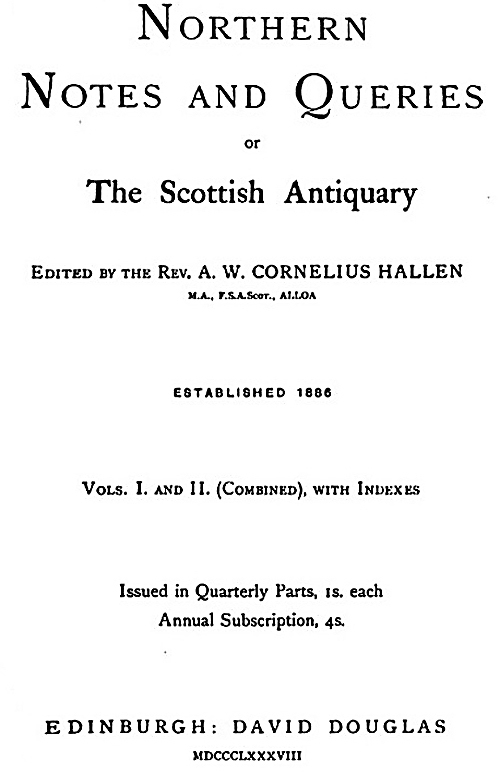 The Scottish History Society, now fairly started, will give a new impetus to historical inquiry. Thus the time seems favourable to the establishment of a quarterly paper which may become in time a monthly issue, and grow from sixteen pages to twice or thrice those dimensions. Its success must in the first case depend on its attaining a fair circulation for the first year, and that can only be secured by the greater number of those who receive this, the first copy, sending at once their names and subscriptions, 4s., to the Editor. The sale of such a paper over the counter is always fluctuating. In order to encourage subscribers, it is arranged that they and they only shall receive the future parts of a transcript of a very rare and interesting ms., AEconomia Rokebeiorum, never before printed in its entirety. The first portion of this is presented with our first Number I the fourth portion will contain Tide-page, Preface, Notes, and a full Index. As this work is paged distinct from Northern Notes and Queries, it will form at the close of the year a complete and most interesting volume. If success attends our efforts we shall endeavour year by year to produce a work on the same plan, and thus we hope to secure a steadily increasing number of regular subscribers. But money is not all that is required—nay, is not the chief thing. We must ask our readers to be literary contributors also. Our first Number, while it may serve as a pattern, as far as size and matter go, is necessarily wanting in the variety which can only be secured by the co-operation of the many. We have been fortunate in obtaining notes from several talented archaeologists, but we have been thrown much on our own resources; we have done our best to present to our readers matter that has not appeared in print before, or only in an obscure way. Of course, also, our Query Column is weak, for we cannot ourselves ask questions ad nauseam, and we have as yet no readers whose curiosity we can invoke. We trust that in our September Number there will be many interesting Queries inserted, and that in January these will receive satisfactory Answers. We appeal to the reading public to support us, and would ask those who receive this our first Number to subscribe, or, if not disposed to do that, to lend or give the paper to some friend who will subscribe. We feel sure that in time such a work as this will make its way, and we shall do our utmost to select such Notes and Queries as may be most interesting and most useful to the Archaeologist, Genealogist and Historian. Uncertain of the reception we should meet with, and of our ability to continue the publication of N. N. & Q., we hesitated to call the first year's issue the first volume, but now that fortune has smiled on us, and a second year has been survived, we think it best to make the age of the work and the number of the volumes coincide, and have given a Title-page and Index for Vols. i. and ii. (combined). Of some parts a few numbers are still unsold, but early application should be made for them. If they can be supplied, their price will be 2s. each.